Once upon a time there was a castle called Zvíkov. You would have expected a king and queen living there. You also could expect this being the beginning of a fairy tale. But it is not. It is a true story, which does not even begin at the castle, but instead, at its surroundings. There, at Zvíkovské podhradí, for about 5 years, one amazing woman named Jana Štěrbová has been running a sewing and handicraft class for orphaned children. It all went well, but she started to feel that children started to be bored by regular work without actual meaning. Knowing about Dr. Klaun´s activities for children in hospitals, she had an idea. She and „her“ children – Irena, Kateřina and Daniel Doubravovi, Petra Svatková, Jaroslava Šedivá and Zuzana Kubišová – started to make stuffed animals with attached personal letters for long-term bed-ridden children. These toys were then distributed at Kladno hospital by Chance 4 Children’s Dr. Clown team. 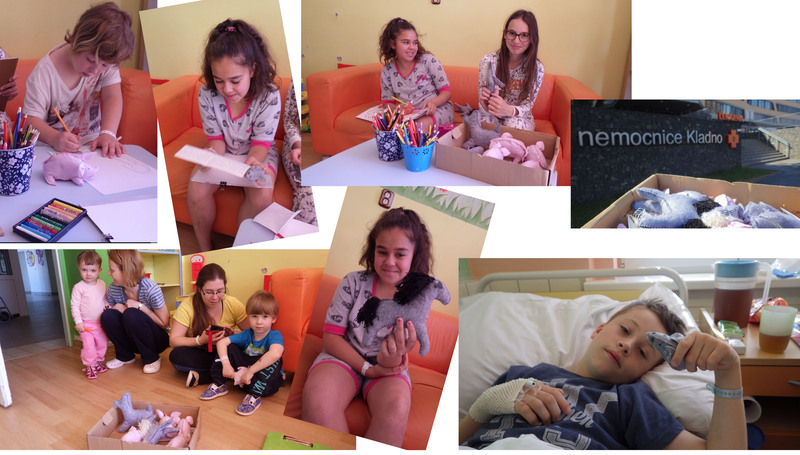 „I could not believe how motivated they became and how they changed their approach from the moment they learned that they can create toys for sick kids, write them personal letters and bring so much happiness to all those hospitalized kids!“ Jana Štěrbová says. But orphans are not the only ones who accepted the challenge to make life of hospitalized children during their reconvalescence more bearable. There is another magic place, where textile toys and dolls are „born“ – this time, in Senior Care Home at Unhošť. There are usually three princes, three fairy godmothers, three challenges in regular fairytales. This story also has a third place where miracles happen. The Municipal Library of Písek has its volunteer program called Dobrá Pomoc – Good Help – managed by a group of ladies. For more than three years they have been meeting together every week in the library’s clubhouse with one purpose: to help people in need. Under the leadership of Mrs Kupcova, they produce small gift items for such people and non-profit organizations. With such a wonderful work it took only one step to start collaboration with Chance 4 Children and, voilà, small patients of Písek Hospital could already enjoy the batch of around fifty dolls, while other volunteers are busy creating more of them.